Star Author: Barbara Else – How is The Volume of Possible Endings different from the first two Tales? This third Tale of Fontania is another stand-alone novel. Some of the characters from the first two come back into it. But the main character, Dorrity, is new. So is the other important character, Metalboy. I like to have new main characters each time because that means there is an interesting (I hope) new story to be told even though it is set in the same fantasy world. This time, there is another difference too. In The Travelling Restaurant and The Queen and the Nobody Boy the characters left home and went on an adventure. With this third one, I wanted to explore the place the novel started. It’s set mostly in Owl Town on the edges of the Beastly Dark, a great forest in the south-west of Fontania. It seems a fairly ordinary place at first, where life always goes on in the same sort of way. But there is only one child in the whole town. That’s odd. And there is a lot more going on than the child, Dorrity, realises. I wanted to find out what lived in the Beastly Dark. I also wanted to figure out what King Jasper might have invented next. In The Queen and the Nobody Boy, he has only recently invented message birds. But that is five years before the story of Dorrity and Metalboy. What would Jasper have invented by now? Though I’d had great fun writing the travel adventure stories of the first two novels, this time it was a change to ‘stay put’ and make the story a different sort of adventure that happens exploring pretty much one place. Star Author: Barbara Else – How cool are maps? I feel very lucky to have an artist as clever as Sam Broad to do the cover and maps for the Tales of Fontania. What are the best things about Sam? He has an amazing sense of fun and drama. I don’t think he could do a boring picture no matter how hard to tried. His illustrations almost zoom off the page with energy. The other thing I really like is how he adds in his own little details. The Volume of Possible Endings is in five parts and each one is headed by an illustration. The one on page 158 is a fabulous raven soldier. See how his foot rests on the toadstool. See the feather dropping off his hunky arm. And take a look at the can of army rations on p 98. It’s pretty disgusting. I love it. The inside covers of The Volume of Possible Endings have a map of Owl Town where most of the action takes place. While I’m drafting a novel, I have to do maps myself to make sure I’m sending the characters in the right directions. I’m very grateful that Sam can look at my scrappy scribbles and turn them into versions that are so much fun and – well, I’ve already said clever. But when it’s about Sam Broad, it is worth saying clever at least twice. At the back of The Volume of Possible Endings you’ll find the Anarchists’ Marching Song – words and music. Anarchists are people who don’t believe in having rules, so the very idea of them marching in step is kind’a ridiculous. But these particular anarchists are rather ridiculous. They’re the guys on the motorbikes on the cover. I didn’t set out to give them a song, but when I was rewriting the novel I thought – hmm, people camping out in the wild often sing around their camp fire in the evenings. So I could give the anarchists a guitar or a piano accordion just for some extra detail. I also find it very funny when people yawn so loudly that it sounds like shouting and gives you a fright. So I put those ideas together. Now, in the finished novel, the anarchists start yawning and it turns into their marching song. By the time I’d written the words for the song, a tune had come into my head. I can’t write down music but I sang it into the recording programme on my laptop and emailed it to Jane Arthur, the very clever Assistant Publisher at Gecko Press. She was able to write the tune down. She even, very nicely, said my singing was all right. But I know she was fibbing. If you happen to be a musician you’ll be able to play the Anarchists’ Marching Song for yourself. If you want to try singing, it will help if you have a very deep gruff voice. Star Author: Barbara Else – How much research do you do when you’re writing a fantasy story? Really annoying answer: it depends. Sometimes you need the exact facts about something in your story. Like, if you want to set a story in the real Paris or an imaginary version of it, you might need to know the name of the river that flows through it (the Loire), what the French call their money (the lire) and those sorts of practical details. It never hurts to check facts or tiny details. For example, I did some research about ocean currents when I was writing The Travelling Restaurant. After all, I figured that sort of thing would be true whether it was the real world or a fantasy. Other times, doing some research can help your fantasy ideas get bigger and better. When I was writing The Queen and the Nobody Boy I wanted an unusual flying vehicle so I looked on the internet for the history of air travel. I learned that one early inventor thought that a plane would never be able to get off the ground so he imagined it being attached to a tower. People would climb up the tower into the plane, then the engines would start and off they’d go. I used that information as a basis for the wind-train that Hodie and Sibilla use to escape the Um’Binnians (except it gets them into more trouble). For The Volume of Possible Endings I wanted to have the first submarine built in Fontania. So I looked up the history of submarines and found heaps of fascinating stuff that happened in our own real world. For instance, centuries ago someone invented a submarine that used oars – underwater! It wasn’t a great triumph. The not-so-annoying answer to today’s question is: no matter what you’re writing, it doesn’t hurt to find out what is possible and use the facts however you like to help your own story. Star Author: Barbara Else – Where do the ideas for stories come from? Answer: ideas come from everywhere and anywhere. The first idea for The Volume of Possible Endings came from a fairy tale. It isn’t one of the best known ones, but I’d been interested by it since I was about ten or eleven. It’s a story of a girl who has either six, seven or twenty-one brothers depending on which version of the story it is. A wicked witch changes all the brothers into swans and the spell can only be broken if the girl sews shirts for them all. I remember thinking what a lot of work that would have been – especially if it was twenty-one brothers. She didn’t have a sewing machine, either. It all had to be done with a needle and thread. Yikes. What really grabbed my interest was how much she must have loved her brothers. But of course, it would have been hard work for me as well to manage twenty-one brothers in a story. I decided that three brothers would be plenty for my story, thanks. And – this isn’t a spoiler – the brothers in this novel don’t get turned into swans. But there is magic involved, and magical wickedness. Anyway, maybe there’s an idea here that you could use for writing one of your own stories. In fairy stories you never get a lot of information about how the characters feel. They just do things, or things just happen to them. So why not start thinking about why the characters in a fairy story come to do whatever it might be. How do they actually feel? Choose a fairy tale you especially like, say, Red Riding Hood. Why would a mother could send her precious child into a forest all by herself? Does Red Riding Hood really want to go into the forest? Or, think about how the wolf feels. For instance, how long is it since he had a good dinner? Or is he just a greedy-guts? Or a bully and a show-off? Could you tell the story from his point of view? That might be fun. Titles are important, aren’t they? A book need one that makes a reader intrigued as to what the story will be about. But if you’re writing a story, you don’t have to have the title right away. Sometimes the right title will just pop into your head at some stage while you’re working on the piece. 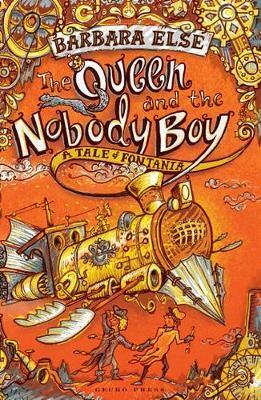 With the second Tale, at first I thought the title would be ‘The Queen and the Elephant Boy.’ That idea soon got tossed aside when I realised it was going to be tricky having an actual elephant in the story. How could my characters have the wild adventures I wanted if they had to take an elephant along? So I made the elephant one that had died and been buried years ago. ‘The Queen and the …something … Boy’. Hmm. I had to choose a good opposite word to queen. Well the boy in the story had been ignored by everyone, treated like a nobody. So there it was: The Queen and the Nobody Boy. Opposite ideas in a title that can catch a reader’s interest. I had no idea what I would call the third Tale. The novel opens with a boy as the main character in the first chapter. Then chapter two moves to a girl, Dorrity, who is the only child in Owl Town on the edge of the Beastly Dark. The citizens boast that their town is magic-free. But Dorrity discovers a book on her teacher’s table. When she opens it, the title page is blank at first. Then words appear on it – ‘The Volume of Possible Endings.’ Pages continue to turn on their own and stop at a list of five endings headed ‘Dorrity’s Tale.’ Magic most certainly exists in the town! She’s scared and offended at being lied to by grown-ups. I was still wondering what to call the novel when I thought – ‘Du-uh! There’s a perfectly good title already there in the story – the title of the book in my book!’ Just as the title of the magical book revealed itself to Dorrity, the title revealed itself to me. If you happen to be struggling to find the right title, have a look at what you’ve already written for your tale. Maybe it is lurking in a paragraph just waiting to be found. Check out these videos of Derek Landy talking about the final Skulduggery Pleasant book, The Dying of the Light. Derek Landy is coming to Christchurch on Thursday 2 October and you can meet him. Read our post about Derek’s tour to find out all about it.